Happy holiday weekend Friday! Do you have big plans for Memorial Day? Memorial Day for most of us is the kick off of grilling and picnic season, so I wanted to share a BBQ-ready salad recipe with you today. It's the perfect side dish for burgers, grilled chicken, or steaks and it's an easy one to transport and eat to any picnic you may be attending this weekend. This salad was inspired by a salad I tried at one of our neighborhood Italian restaurants last summer. 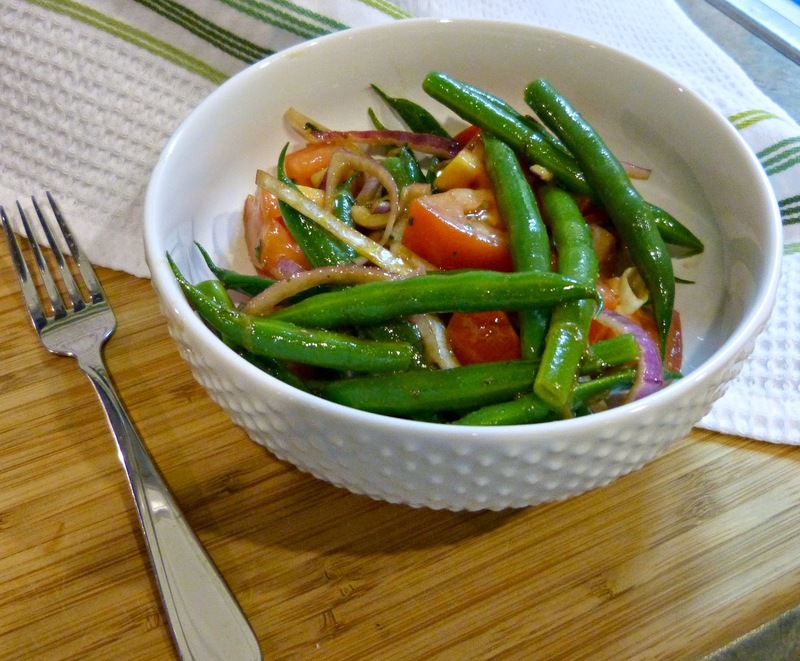 We were sitting on their patio enjoying dinner outside on a warm night and this salad caught my eye: crisp green beans and meaty tomatoes tossed in a sweet vinaigrette. They also added crumbled feta to theirs, which was amazing. A little feta and some toasted pine nuts could actually transform this salad into a delicious vegetarian entree. For the purposes of a backyard BBQ though (where temps could get warm), I'd recommend steering clear of cheese. This is sort of the alterna-picnic salad: there's no potatoes, mayo, or macaroni involved here, which means it's also pretty good for you! Fresh veggies and a light vinaigrette make this flavorful salad deceptively tasty and a great guiltless addition to your picnic spread. Bring a large pot of water to boil. Add green beans to the boiling water and cook for 3 minutes. Remove from heat and drain the beans well and immediately rinse with very cold water or pour beans into a large bowl filled with ice to stop them from cooking. In a separate large bowl, whisk together olive oil and next 7 ingredients (through salt and pepper) until combined. Add green beans to the dressing mixture and toss to coat. Stir in the tomatoes and red onion and season with additional salt and pepper, if necessary. 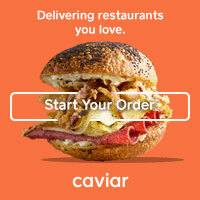 Looking for another non-lettuce salad to serve? 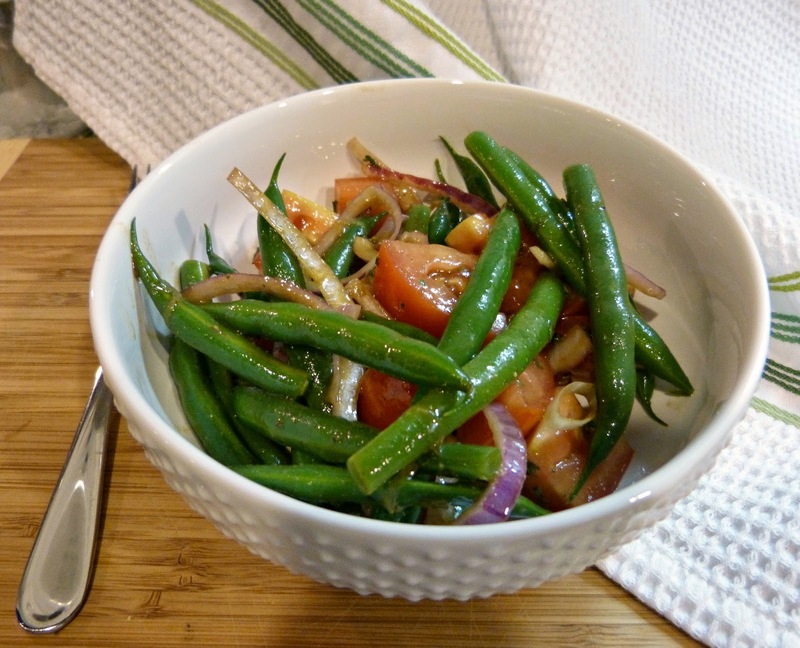 Try Roasted Vegetable Salad or Potato & Green Bean Salad! So jealous, Jillian-- enjoy the weekend! !